If you are familiar with using <div> rules, there are a few you can apply to your scripted tables. Two examples are shown below. Contact a webmaster for help with <div> rules; these are only meant to show some basic possibilities. Webmasters: you may use CSS to specify styles for the table which is used for the html tags DIV, SPAN, TABLE, TR, TD, etc. If you are pressed for room for the table, you can encase the table code within a div that forces the table into a specific size with scroll bars. 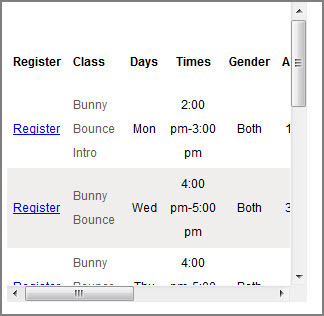 This example filters to Cat1=Bunny, hides the Description and Openings columns, and places the table inside a defined-size scroll of 300x300 pixels. If you want to specify a color for the complete table background you can use a div style with the html color name or hex number. In this example, we are using color #D8BFD8. For a complete list of special effects parameters, view the Tricks page. Any special effects not listed there are not available via Jackrabbit and would require the coding skill of a webmaster to further manipulate the table displays.